Monday July 30, 2018 - Kiharu MP, Ndindi Nyoro, has said he will not apologise to anyone for being part of Deputy President William Ruto’s Tanga Tanga squad. Tanga Tanga squad is a nickname given to politicians who accompany Ruto during his trips across the country for a small stipend. Speaking during his homecoming party in Gaturi on Sunday, Nyoro said the entire Murang’a County is solidly behind Ruto’s 2022 candidature and no amount of intimidation will stop leaders from Murang’a County from campaigning for DP. The first term MP sent the crowd into wild cheers after he vowed to stay put in the DP’s camp despite pressure to abandon it. 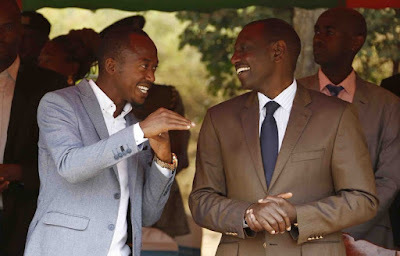 “They have approached me to go slow but I’m focused and can’t be distracted, it is Ruto in 2022,” he said in Ruto’s presence. A section of Mt Kenya politicians led by Interior PS, Karanja Kibicho, have been warning Central Kenya MPs against campaigning for DP. The leaders have been telling MPs to concentrate on President Uhuru Kenyatta’s Big Four agenda instead of campaigning for Ruto’s Presidential bid in 2022.